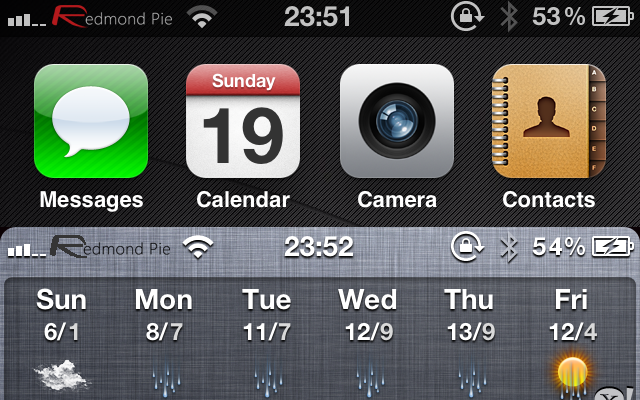 The Redmond Pie Zeppelin Custom Carrier Logos For iPhone And iPad Are Here – Download Now! 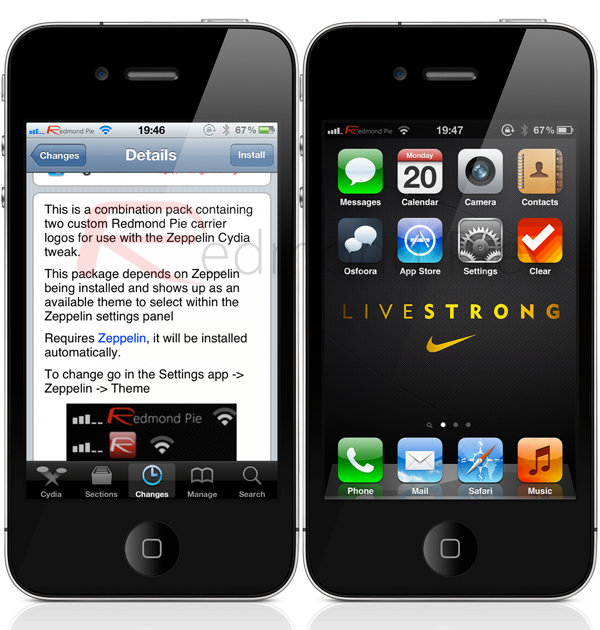 One of the most talked about Cydia tweaks so far in 2012 has to be the fabulous Zeppelin modification by developer Alex Zielenski, which offers users the ability to not only set a custom image to display in place of the carrier name, but also to easily create and add their own logos of whatever they desire. Since Zeppelin was released, we have been having lots of fun with it, downloading logo packs from Cydia and seeing all of the excellent offerings which the community has created, but we thought it was about time Redmond Pie was represented in Zeppelin. Our loyal readers, who we appreciate so much, can now jump into the Cydia store and download the official Redmond Pie logo pack free of charge – provided you have a jailbroken iOS device of course. The logo pack contains the standard Redmond Pie logo that adorns out website as well as an icon style logo which can both be used in place of that boring carrier name that we are sure you guys get tired of looking at. For those that aren’t yet familiar with the Zeppelin tweak, it basically overrides the settings which assign a user’s specific carrier name to the top left hand corner of the device’s display. Previous Cydia offerings have allowed users to replace the carrier text with their own custom text, but this has always been limited to just plain words and has never allowed actual logos to be shown, until now. By creating graphics, or downloading packs, users can harness the power of Zeppelin to customize the carrier placeholder with pretty much anything they like, as long as it is created within the size limits. Zeppelin isn’t a brand new Cydia entry, but it is a tweak which has been gaining some serious traction recently thanks to the community’s chatter, as well as different graphic packs appearing in Cydia. The tweak itself has also benefitted from a number of issues since launch which have offered some stability improvements, as well as being able to quickly change themes from the Settings menu without having to respring the device each time which offers a significant user experience improvement. We have previously covered the launch of the Zeppelin tweak, as well as a run through tutorial on how users can create their own Zeppelin compatible logos, but for those die hard Redmond Pie fans out there, you can now head on over to the Big Boss repository and grab your slice of Redmond Pie Zeppelin heaven. Feel free to take a few screen shots and share your images on our Google+ and Facebook feeds.